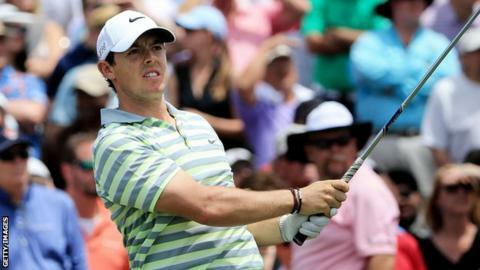 Rory McIlroy won his first WGC Match Play title last week in San Francisco. Rory McIlroy shot a second round one-under 71 to remain in contention at the halfway stage of the Players Championship in Sawgrass, Florida. The world number one finished four shots behind joint leaders Kevin Na and fellow American Jerry Kelly. Na backed up his opening-round 67 with a three-under 69, while 48-year-old Kelly shot a seven-under 65 on day two. England's Ian Poulter is among the group of players tied for 13th alongside Northern Ireland's McIlroy. Tiger Woods (71) made the cut at the tournament for the 17th successive time thanks to a birdie on his final hole - the ninth - that left him at level par for the tournament. Masters champion Jordan Spieth missed the cut on three over, along with England's Justin Rose and Spieth's fellow American Phil Mickelson. The 21-year-old Spieth, playing partner of world number one McIlroy at Sawgrass, said of the 26-year-old four-time major winner: "His career is certainly farther ahead of any younger player, including myself. "I never thought there was a rivalry. I have to work hard to get to that level." McIlroy is chasing back-to-back wins after last week's victory in the WGC Match Play.